Maryland Milestones, a brand established in 2012 by Anacostia Trails Heritage Area Inc., highlights the first and unique moments which have occurred (or are occurring) in the (Maryland Certified) Anacostia Trails Heritage Area. This program brings information about these “milestones” to the public and makes connections between the history, culture, and nature of the region. 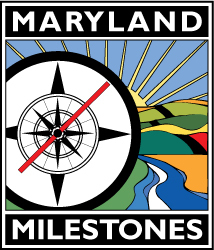 Additionally, the Maryland Milestones brand emphasizes the importance travel, trade, and communication have played in the region – through turnpikes, highways, parkways, aviation, streetcars, telegraphs, and train travel. This program involves updating signage, creating information kiosks, building a heritage center, and development of interpretive heritage routes. ATHA Inc. has a governing/advisory board made up of representatives from our partner communities to set goals and a managing board for day-to-day operations. We are a 501(c)3 organization under the IRS code. The organization originally served in an advisory capacity to the Redevelopment Authority of Prince Georges County. In 2010 the organization took full operation of the Heritage Area. Patricia Williams Secretary Cultural Resources Management Inc.
Carl Smith Marketing PGC Conference & Visitor’s Bur. Aaron Marcavitch Executive Director ATHA Inc.
Kirstin Falk Program Manager ATHA Inc.
Matthew Neitzey Director PGC Conference & Visitor’s Bur.